Are you considering placing a loved one into aged care but can’t figure out where to begin? If you answered yes, speaking with aged care consultants will certainly bring you some peace of mind. Placing a loved one into aged care is a decision many Australians struggle with. While there are many things to consider, the biggest concern is usually about how to handle the finances. A financial adviser will however, help you navigate this seamlessly as they understand the process. Having financial clarity about the situation will help you fully understand how the cost of aged care relates to the needs of your loved one. Whether you’re interested in immediate care or simply want to start planning for the long term – you will receive the help and advice you need to make the right financial choice. Transitioning into aged care can be a stressful time. 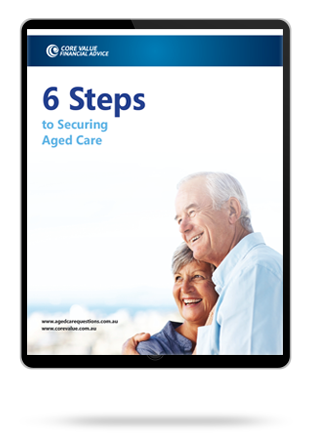 This step-by-step guide to securing aged care will hold your hand through the entire process. From determining affordability to advice on financial planning strategies; to finding a home and making sure all the boxes are ticked for Centrelink. Feel confident in your aged care decisions. Get your copy today. How Can Aged Care Consultants Help? Finding the right information to help you make the best financial choice can seem overwhelming at a time like this. Instead of taking it all onto yourself, talk to aged care consultants as early as possible. Their advice and guidance will help make the transition a much easier and stress-free process. They will help you figure out what fees you may have to pay. They will also advise you on Centrelink payments so that you can make the most of the benefits due to you. The consultant will help you understand your financial situation and then figure out how to comfortably finance the costs of aged care. They will assess your home and other assets and then advise you on whether to sell these assets when going into aged care. Aged care consultants will help you manage your finances correctly, negotiate costs on your behalf and avoid significant costs that you may otherwise not be aware of. This will definitely ease up the financial load. Next comes the paperwork. This may not seem difficult until you actually get down to it. A little mistake could see you miss out on important benefits or have you paying excessive fees. With professional aged care consultant services you’re sure of which forms to complete, what to put in those forms, when to complete the forms and where to send them. With the right advice you will be able to find the right aged care outcome that will meet your loved one’s needs. Aged care placement is an emotional journey that is often confusing for most people. A little hand holding by reputable aged care consultants will go a long way to help you through it. At Core Value we can help guide you on the best aged care solution for your loved one. With our tailor-made financial consultancy services, we can save you lots of time, money and unnecessary stress. We are here to lead you through the process as well as answer all of your questions and concerns. For aged care consultants in Sydney? For aged care consultants in Melbourne? For aged care consultants on the Gold Coast? Call us today on 1300 944 011 for a consultation with an expert aged care adviser. We will assess your unique situation and advise you on the options available to you. Contact us for a FREE consultation or please call 1300 944 011.